Last year I made contact with one of my DNA matches on 23 & Me, but I did not know how we were related because I did not know that the name Primus was part of my family tree at that time. Click to enlarge documents below. To navigate back to the blog post, click on the arrow up there at the top of the page. 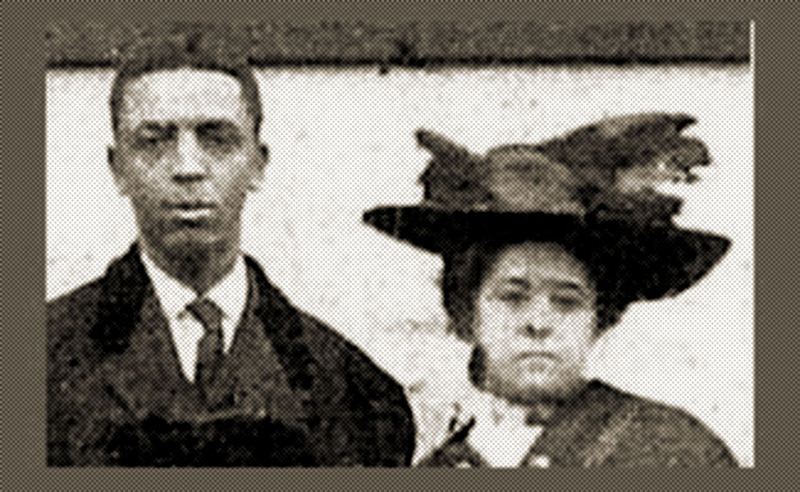 My grandparents – Dr. Albert Buford Cleage and Pearl Doris Reed in 1909 outside of Witherspoon United Presbyterian Church, Indianapolis, Indiana during the time the letters were written. In November of 2016, during “National Novel Writing Month” I was working on writing a book using my grandfather Dr. Albert B. Cleage’s letters to my future grandmother, Pearl Reed Cleage. 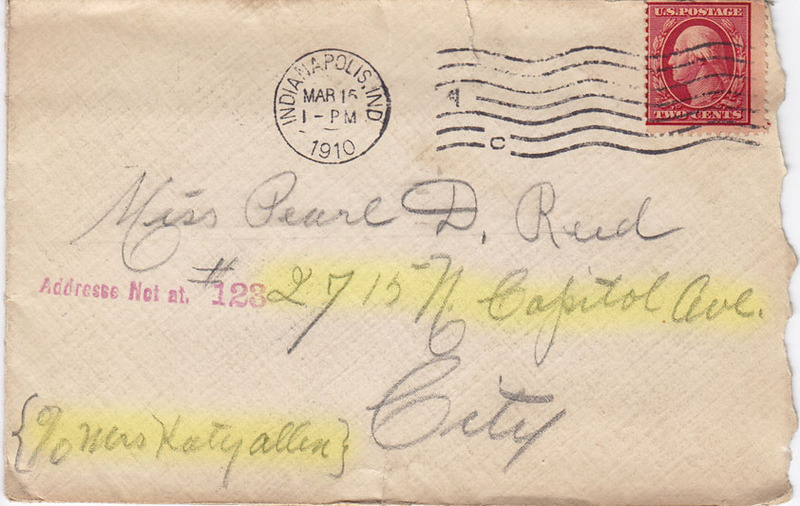 At one point he was sending letters to my grandmother c/o Katy Allen. 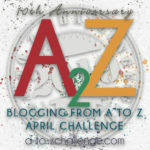 I couldn’t find Katy Allen the first time I looked a few years ago when I was first blogging about the letters. 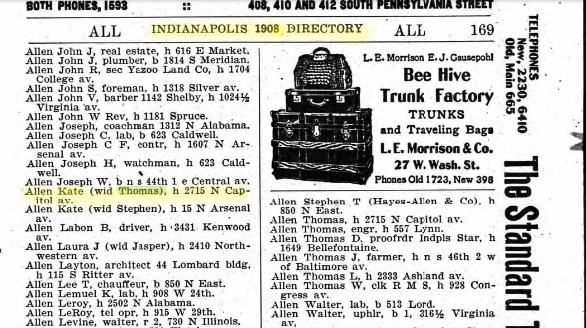 I took another look and found Kate Allen in the Indianapolis directory. Using Katy Allen’s address I was able to find her in the 1900 census, along with her husband Thomas Allen. 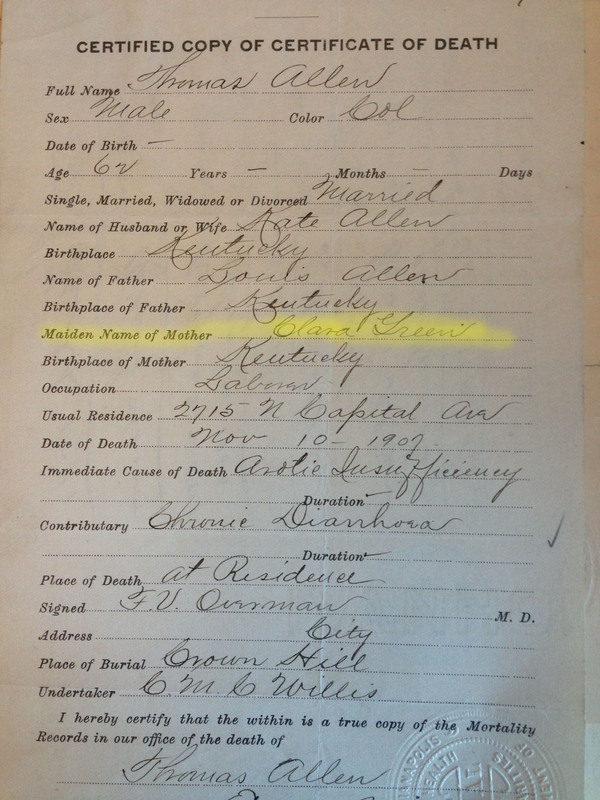 Looking at his death certificate, I was stunned to find that “Clara Green” was listed as his mother. 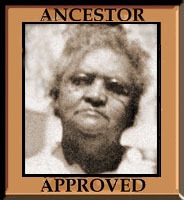 That was my great grandmother Anna Ray Allen Reed’s mother. Thomas Allen was her brother. 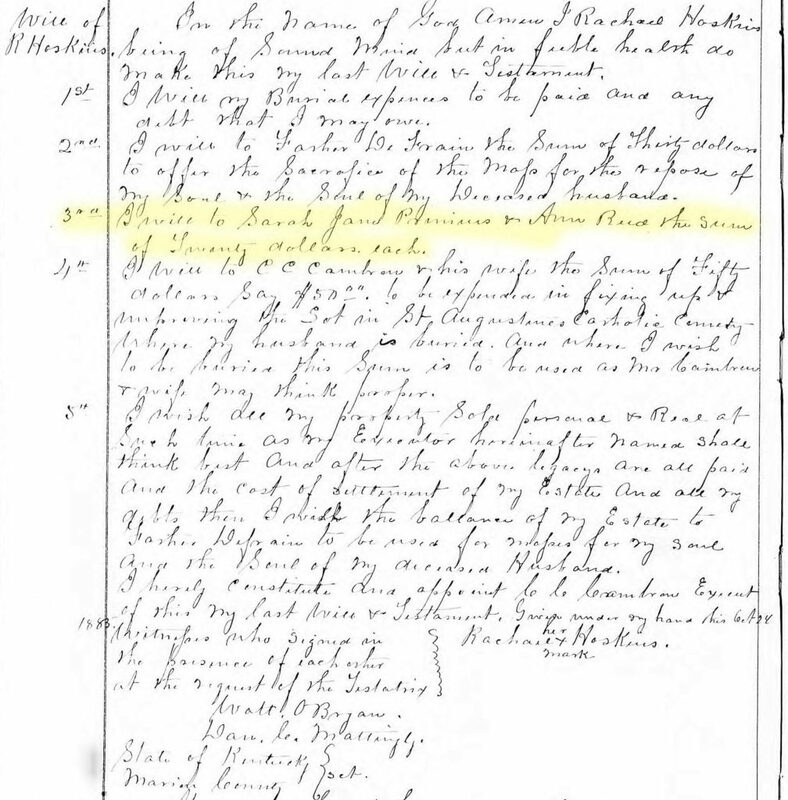 I found Thomas Ray in the 1870 census living with Sarah Primus/Prymous. Family relationships are not given in the 1870 census. I had experienced family members living together without being identified as such before and wondered if Thomas and Sarah were siblings. I set up a tree for Sarah and the Primus family and eventually found a death certificate for one of the children where Sarah’s maiden name was given as “Ray”, which was Thomas’ last name before he changed it from the slave owner’s surname of “Ray” to his father’s name, “Allen”. Read about that name change in his Will here. 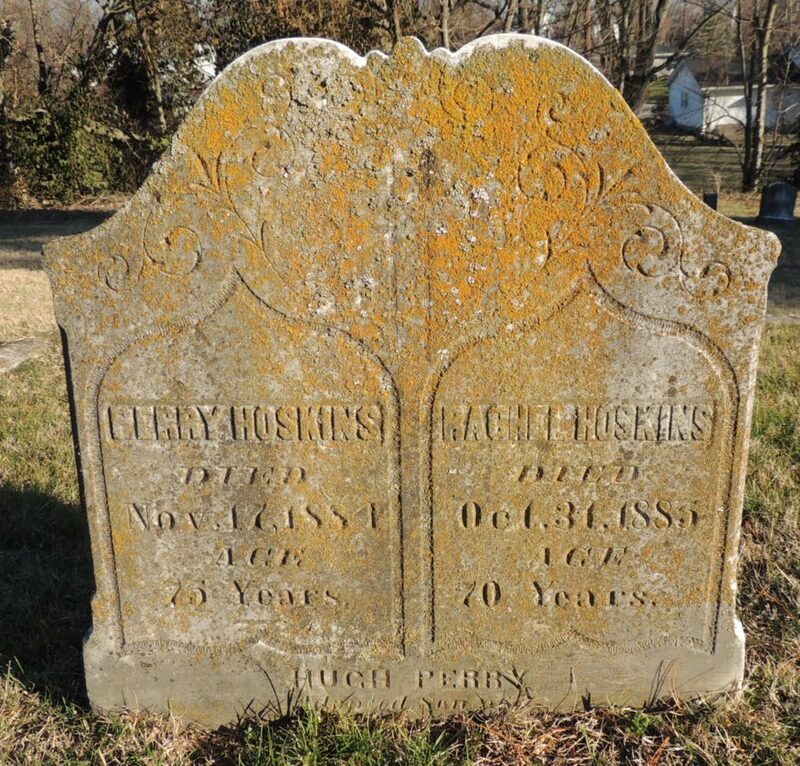 My grandmother’s handwritten family tree gives her grandmother’s name as “Clara Hoskins.” I was never able to find her using that name because she was married to James Green in the 1870 and 1880 census and using Clara Green. I had found Perry and Rachael Hoskins living near Clara in the 1870 and 1880 census. They had also been free and enumerated in the 1860 census. I decided to take another look at them. Although the Death Records for Marion County do not include the 1880 and 1890, I found their graves in Find-a-grave. And I found their Wills. Perry died first. He left everything to his wife Rachael. Racheal left money to St. Augustine Catholic Churches priest and for the upkeep of her husband’s grave. She also left $20 each to Sarah Jane Primus and Anna Reed. Unfortunately she did not mention any relationship with them. One day recently, I received an email from 23 & Me. I had 80 new relatives waiting to discover our link. I decided to go look and see who they were. I have not checked 23 & Me recently because I can never make the connections between the DNA and my tree. 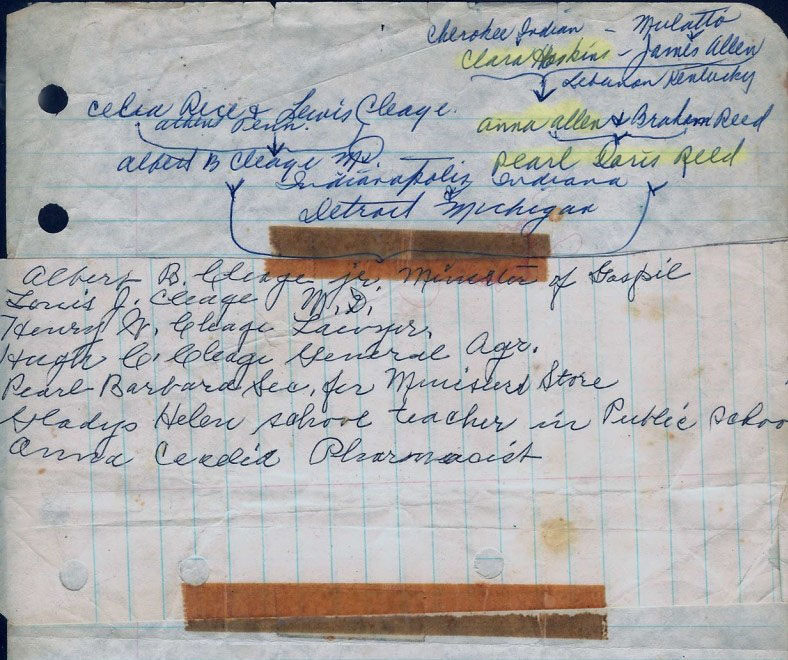 I wrote a contact who matched me, my aunt Gladys and several of my second cousins in the Reed line. She wrote back and gave me two names that didn’t mean anything to me. Then she added the message “Also look for the name Primus or Promise. My dad’s great grandmother was Sue (Susan) Rae Primus”. PRIMUS! Just the family I had been looking for a connection with! 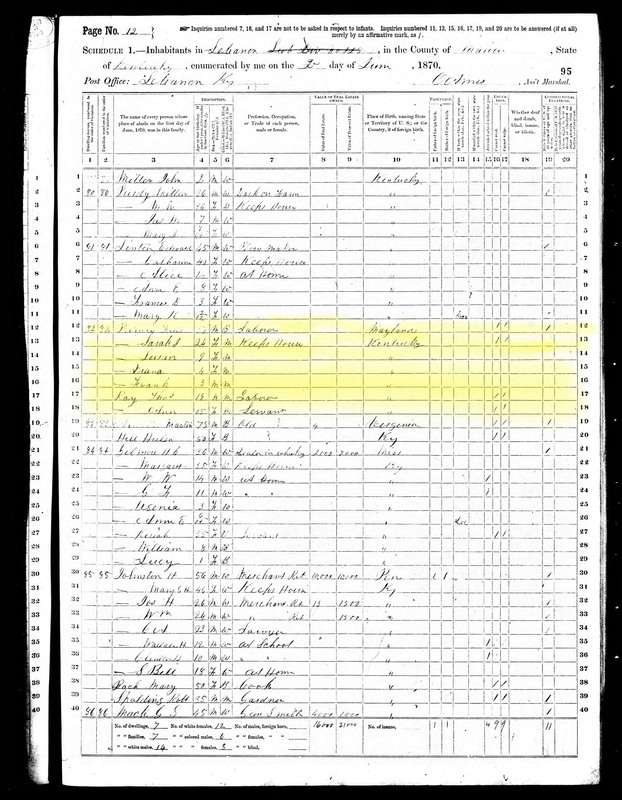 You can see Susan Primus up in the 1870 census as a nine year old. I had found Susan, one of Sarah’s daughters, but I had not found her marriage record, so her married name meant nothing to me, but Primus! These were the very people I had spent the last couple of months researching! And because I had done all that research, I knew who they were. The connection between two of my great great grandmother’s children has been made. Now I want to find the link between Perry and Rachael Hoskins and my great great grandmother Clara. Excellent article!!! This is amazing! I’m so glad you like it. Can’t wait until the Baptism cd arrives! Yes. I sent in my order the next day after you told me about it. How exciting! I get an adrenalin rush when I see connections like this being made. 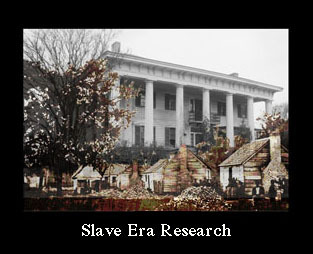 It does take a lot of research but what a thrill when the research and the DNA come together. Thanks Jan! And all because you copied those letters plus envelopes for me! I’m already thinking of my post on Thomas and what i found about him in his pension file. Congrats on your amazing discovery. I have visited Crown Hill Cemetery on several school field trips. I love seeing all of these documents and how you used them to connect the dots. I went once about 12 years ago to visit the grave of my grandmother’s brother George. I had no idea there were other family members buried there. I’m glad you liked seeing the documents. I wrote it up first without the documents, but I thought seeing them made the trip more real. Wow this is so exciting! I love amazing discoveries like this, when all the pieces just seem to come together at just the right time. Very happy for you. Doing all that research paid off. Congratulations on your DNA connections. It makes me feel like I’m not just spinning wheels doing so much research into people that I’m not sure are related to me. I just get giddy when I section research connections like this. Excellent work indeed! Oops! sorry for the typo above. I just get giddy when I “see” research connections like this. Excellent work indeed! Either way, I knew it was a complimentary comment. The work you lovingly gather is most amazing. You’re entire family, generations before, right now, and after you are akin to stars shining in joy at all you do. What a poetic way to put it. Thank you Elaine! It’s amazing how you were able to pull together so many pieces of this puzzle. Kristen – After I read your article my mind started to wonder. Years ago my mother was speaking to her sister Annie, my Aunt Annie, on the telephone. I was playing on the living room floor. Heard Mom speak the word “Primus” over the phone. Being 5 years old and never hearing the word Primus before, the word stuck in my head. The sound of the word must have tickled my brain. I wish could remember more. They were discussing people – that’s what Mom told me when I asked what were they talking about. 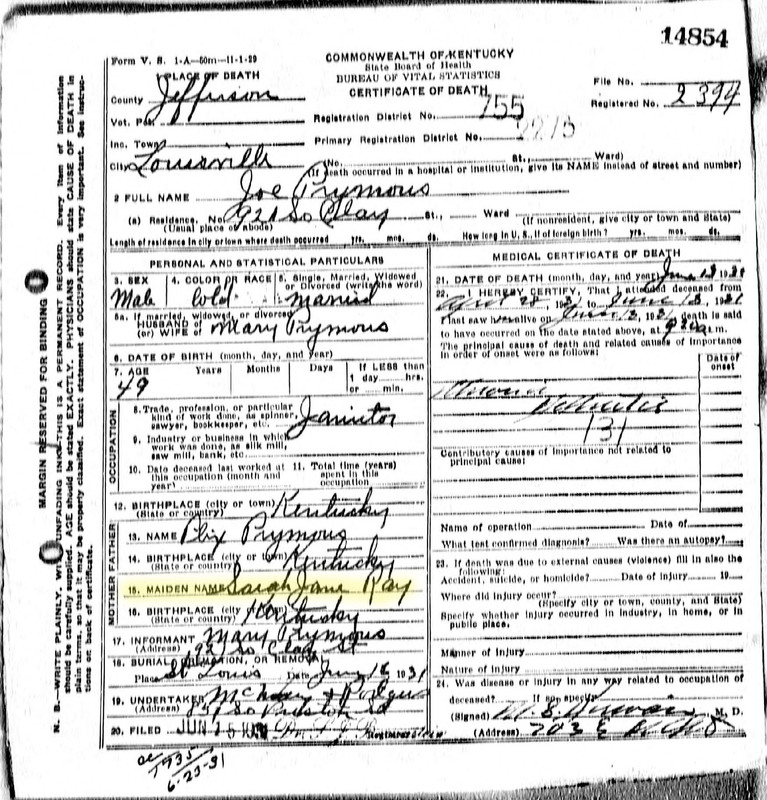 Hmmm, wonder what was happening with the Primus family about 1945… Is that the right year? I’ll have to check. Interesting how memories work. Kristin – Yes, late 1945/early 1946. I remember some snow was on the ground, and I was doing morning Kindergarten. The call was probably in the afternoon. Whatever generated their discussion I don’t know. The sisters (Anna, Louise, Marie – all in Detroit at that time) and Mom called each other a lot in those days before they left Detroit in the late 40s and early 50s. It’s too bad they, and their family history knowledge, are not around now. Kristin I believe that we are related I am a Turner descendent. Joseph and Luella Turner are my great grand parents. Daniel Turner is my grandfather, born in 1906.